The script is already ready, you can found it at MouseHunt Travel Advisory website or visit userscripts.org website. After more than a week of spending my free time learning and working on user script (also call Greasemoneky script), I finally come out a prototype of MouseHunt Travel Advisory (a temporary name given to my created script). This script build specially for MouseHunt application in Facebook. It is able to calculate the cheapest route from player’s current location to location the player wish to travel to. It work similar to Pooflinger’s Travel Planner, but this script read player location directly from the application and embed the result directly into application instead of opening another tab for travel planner. 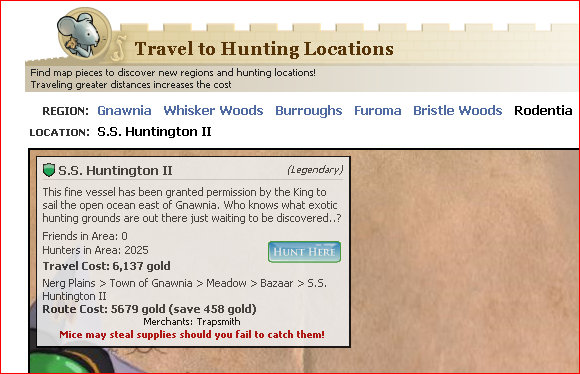 Well, this script may not sound so good for hunter who own a lot of gold, but this script should be good enough for hunter who want to save as much as gold yet lazy to open another tab to look for alternative route when travel. Currently, I was only able to complete the AJAX part (require the whole web page is fully loaded before player click on any location) and yet to complete the HTML part (doesn’t not require the whole web page loaded before player click on any location). The script also face some performance issue where travel to location required a lot of gold such S. S. Huntington II or Dracano (the script need to loop through a lot of route), but I had found a solution for this. The script should be able to complete in this few days (if I’m hardworking enough). Thanks. Showing my passion on MouseHunt and programming at the same time! don’t give up as well as keep posting simply because it just simply worth to read it.